Pitt sciVelo partners with The University of Pittsburgh Innovation Institute and Clinical and Translational Science Institute to develop critical paths for translational research to extend into the marketplace. As part of the University of Pittsburgh Innovation Institute, sciVelo manages the Pittsburgh Health Data Alliances’ Center for Commercial Applications of Healthcare Data (CCA) and provides commercial translation support to accelerate the success of CCA-funded research projects. At Pitt, sciVelo fosters a culture of commercial translation by activating and supporting investigators to engage in research of impact as part of The Plan for Pitt. However, the “sciVelo” name – a contraction of “science” and “velocity” – not only represents accelerating life and health sciences innovations, but also accelerating team members’ career paths. The high-performing integrated team of clinicians, scientists, and business experts are mostly full-time Pitt junior faculty, post-doctoral fellows, and PhD candidates in pursuit of professional expansion. “Our team of experts is one of sciVelo’s key differentiators, and they receive the benefit of professional development and growth. sciVelo provides team members with versatility beyond the niche of their professional or graduate degrees to propel their careers forward and achieve success.” said Dr. Don Taylor, Assistant Vice Chancellor for Commercial Translation in the Health Sciences and Executive Director of sciVelo. A prime example of sciVelo’s professional development capabilities can be found within the story of Former sciVelo Commercial Translational Associate, Dr. Bradley Campell. 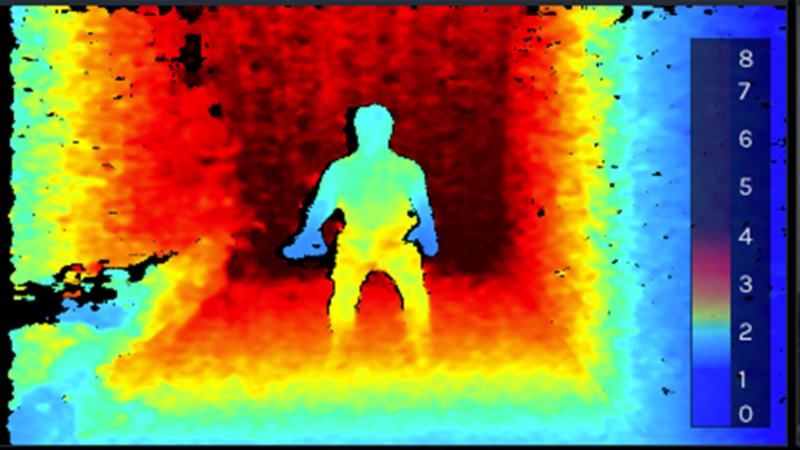 Finite element modeling – a numerical approach for solving structural and mechanical problems to measure and predict physical response in real world environments – is one of the many skills in the toolbox of Dr. Bradley Campbell, a former TL1 Postdoctoral Fellow at the University of Pittsburgh Biodynamics Lab. Dr. Campbell’s engineering expertise centered on orthopedic biomechanics and performing basic scientific research investigating maladies of the foot and ankle. 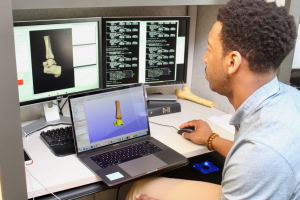 In 2016, he earned his PhD in mechanical engineering from The University of Pittsburgh Swanson School of Engineering and transitioned into his fellowship, where he leveraged his expertise to create finite-elemental analysis 3D models of the ankle to examine loading between the tibiotalar joint through standing, walking, and running simulations. The clinical translation significance of Dr. Campbell’s work is substantial, as mechanical loading is the key extrinsic factor regulating joint tissue homeostasis and pathogenesis of joint disease. Maintenance of articular cartilage, the connective tissue surrounding and protecting joints to move freely, is paramount to joint health. Dr. Campbell’s research has led to a further understanding of the loading environment of articular cartilage in healthy ankle joints. 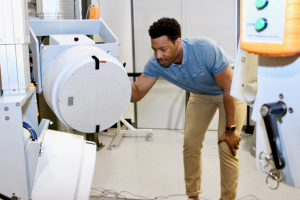 His research included 3D ankle simulations of patients with healthy joints during physical activity to provide insights on cartilage pressure distribution. Results of Dr. Campbell’s research provided a clinical tool to correlate effects of pre-and post-operative ankle pathology on cartilage loading. Yet, during the time of his postdoctoral fellowship at Pitt, Dr. Campbell’s intrigue expanded beyond the research bench. Inspired by the evolving clinical translation and commercialization ecosystem at Pitt, he grew passionate about assisting investigators in their translational research. Dr. Campbell joined the sciVelo team in October 2016 as a Commercial Translation Associate while also maintaining his full-time fellowship. Dr. Campbell was initially assigned the responsibility of conducting market analysis for Tumor Driver Identification (TDI), an oncology precision medicine initiative led by Dr. Greg Cooper and Dr. Xinghua Lu of The University of Pittsburgh Department of Biomedical Informatics that was awarded funding by The Center for Commercial Applications of Healthcare Data. Assisting this team with their commercial translation project pitch taught Dr. Campbell the value of market due diligence and market research. “I learned quite a lot in that role. In combining my scientific background and transferable skills with mentorship from sciVelo leadership including Kathrin Gassei, PhD, and Andrew Brown, PhD, I successfully acquired the commercialization know-how to advance translational research projects,” said Dr. Campbell. The sciVelo model intends to help team members propel their careers from the University in areas that they otherwise would likely not have directly reached. For Dr. Campbell, this time is now. He will advance his career to Cognizant Technology Solution’s Business Consulting as Senior Consultant in the Life Science Group. Dr. Campbell aims to continue honing his commercial translation skills to later fulfill his aspirations of leading a venture capital firm for life science and healthcare start-up technologies. 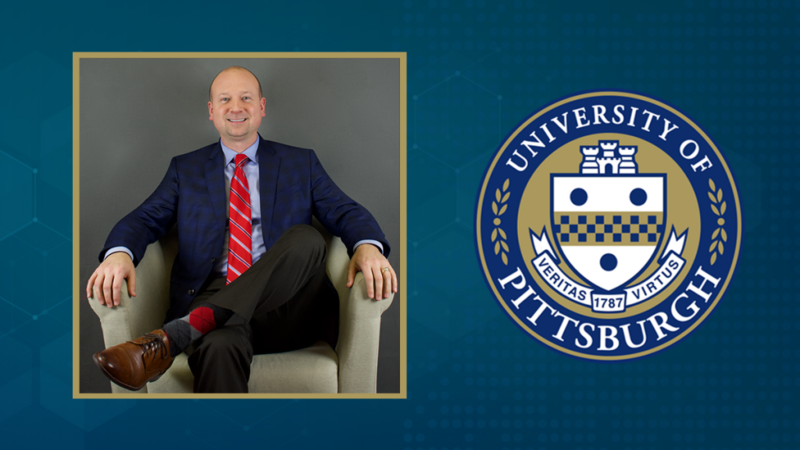 Dr. Campbell has been an asset to the Pitt sciVelo team in his tenure, serving as project lead for various early-stage translational research projects pitched to the Center for Commercial Applications of Healthcare Data for funding. Dr. Campbell has had the opportunity to work on many stages of commercial translation from ideation to commercialization, such as problem statement development and market analysis. As Dr. Campbell looks forward to his bright future, the sciVelo team reflects on his achievements and contributions. The sciVelo cycle of attracting and retaining top talent continues to advance Pitt’s translational research mission and the career mission of our team members.